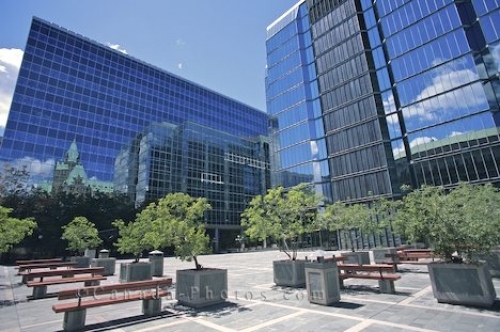 The glass facade of the Bank of Canada in the Upper Town of Ottawa, Ontario with the exterior having benches and trees in a park like setting. The twelve storey building housing the Bank of Canada is situated in the Upper city of Ottawa, Ontario with a tinted glass facade. Outside the Bank of Canada, you can relax on a bench and enjoy the park like terrace. Bank of Canada, Ottawa, Ontario, Canada, North America. Picture of the Bank of Canada building in Ottawa, Ontario with shining mirror images of the park and buildings.